Mail from US Customs reveals products from Judea and Samaria are not to be labeled as being from 'Israel,' on pain of sanctions. 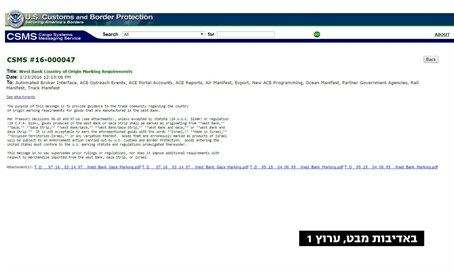 A mail from the Cargo Systems Messaging Service of the US Customs and Border Protection dated to this Saturday, and revealed by Channel 1's "Mabat" show on Thursday, shows the US is now required products from Judea and Samaria to be labeled differently. In new instructions on marking requirements sent out to American importers, goods from Judea and Samaria are not to be marked "Israel." Those who do not comply are to be sanctioned. "West Bank Country of Origin Marking Requirements," reads the title of the mail, which begins by clarifying that "the purpose of this message is to provide guidance to the trade community regarding the country of origin marking requirements for goods that are manufactured in the West Bank." "Goods produced in the West Bank or Gaza Strip shall be marked as originating from 'West Bank,' 'Gaza,' 'Gaza Strip,' 'West Bank/Gaza,' 'West Bank/Gaza Strip,' 'West Bank and Gaza,' or 'West Bank and Gaza Strip.'" "It is not acceptable to mark the aforementioned goods with the words 'Israel,' 'Made in Israel,' 'Occupied Territories-Israel,' or any variation thereof," warned the mail. It threatened that such goods that are marked as products of Israel "will be subject to an enforcement action carried out by U.S. Customs and Border Protection." The instructions were published on Saturday, apparently due to complaints by Palestinian Arabs and leftist organizations in the US, who claimed there is no enforcement of the 1995 American law on marking goods from the region. The US State Department confirmed the details of the mail, and explained that the labeling does not distinguish between Jewish and Arab goods from the region, instead simply defining the entire area as not part of "Israel." The Obama administration gave support to the EU decision last November to label Jewish products from Judea, Samaria and the Golan Heights. In December the EU double-standard in the move was put on display as a top European court struck down a trade deal with Morocco in the occupied Western Sahara, and the EU responded by petitioning the ruling. Last Tuesday US State Department spokesperson John Kirby indicated the Obama administration also supports the EU's controversial resolution from the day before, according to which EU agreements with Israel no longer apply over the 1949 Armistice lines. Regarding the legal status of Israel's presence in Judea and Samaria, and consequentially of products from the region and agreements in it, the 2012 Levy Report proved that Israel's presence is legal according to international law. However, despite being commissioned by Prime Minister Binyamin Netanyahu, two consecutive coalition governments led by him have yet to adopt the findings of the report.